Envision Solar a finalizat de curand constructia unei parcari acoperite cu panouri fotovoltaice. Contractul pe care compania le-a avut cu gigantul IT Dell prevede o productie de electricitate de 130kW anual. Energia electrica generata va fi disponibila pentru vehiculele electrice ale angajatilor si nu numai. Centrala electrica nu polueaza sub nicio forma si nici nu ocupa spatiu, fiind montata pe acoperisul parcarii. Envision Solar a lucrat impreuna cu partenerii sai: Coulomb Technologies, Axion Power International – producator de baterii si SAPA care s-a ocupat de structura. Panourile fotovoltaice raman in continuare destul de scumpe si aproape inaccesibile publicului larg. Pe site-urile romanesti un panou fotovoltaic care produce 100W costa in jur de 500 de euro. De acesti bani ati putea cumpara direct de la Electrica o cantitate de energie electrica echivalenta cu productia panoului fotovoltaic pe o perioada de 12 ani. Envision Solar International, Inc., the leader in solar integrated building systems, announced today the completion of a solar shaded parking structure of Solar Trees® at Dell’s headquarters in Round Rock, TX. This configuration of Solar Trees®, called a Solar Grove®, is designed to produce more than 130kW of solar power, helping avoid 145,000 pounds of greenhouse gas emissions per year. Round Rock, TX (PRWEB) October 20, 2009 — Envision Solar International, Inc., the leader in solar integrated building systems, announced today the completion of a solar shaded parking structure of Solar Trees® at Dell’s headquarters in Round Rock, TX. This configuration of Solar Trees®, called a Solar Grove®, is designed to produce more than 130kW of solar power, helping avoid 145,000 pounds of greenhouse gas emissions per year. 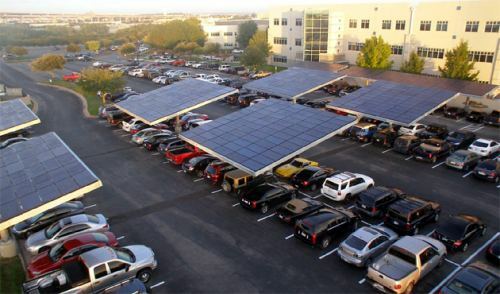 Led by a group of visionary architects, builders and engineers, Envision Solar transforms heat-absorbing parking areas into beautiful, efficient solar power plants. McBride Electric, the general contractor of the project, chose Envision Solar as its partner because of the company’s success and experience in designing and installing aesthetically superior Solar Integrated Building Systems (SIBS™). The Solar Trees®, located in the Dell employee parking lot, will simultaneously shade 50 parking spaces and generate clean electricity directly from the sun. In an example of Vehicle-to-Grid (V2G) technology, the solar arrays also incorporate two Envision Solar CleanCharge™ solar charging stations utilizing Coulomb ChargPoint™ for Electric Vehicles (EVs) and Plug-In Hybrid Electric Vehicles (PHEVs). Photos can be viewed here. „Dell’s commitment to environmental sustainability is a beacon to organizations worldwide. We’re proud our Solar Trees® and CleanCharge™ solar charging stations can help serve as visible symbols of their environmental stewardship. The future of electric and plug-in hybrid vehicles has arrived and our experience in solar innovation has allowed us to lead the market in the development of solar charging stations,” said Robert Noble, CEO & Chairman of Envision Solar. Envision Solar partnered with McBride Electric Inc., BP Solar and The Weitz Company to design and build the Solar Grove®. For more information on Envision Solar, visit www.envisionsolar.com. Founded in 1855, The Weitz Company is a national full-service general contractor, design-builder and construction manager with offices in 11 states and Guam. The company’s expertise includes office, retail, residential condominiums, tenant interiors, resort properties, parking structures, industrial, healthcare, education, government and mixed-use facilities. More information about The Weitz Company is available at http://www.weitz.com.